Leavitt came into the game wanting to get out and run, and boy did they do that. The Hornets got out to a 22-3 first quarter lead and Kristen Anderson shot from everywhere on the court as Leavitt raced past Cape Elizabeth for a 67-39 win. Leavitt jumped out to a 12-0 lead less than three minutes into the game. Five different Hornets scored, led by Anderson and Capt'n Eli's Player of the Game Adrianna Newton with 6 points a piece. 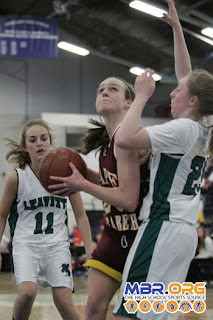 Kayla Raftice was the only Cape scorer for the first quarter and a half as Leavitt played some menacing defense, flustering the Capers with a full-court press. Anderson and her sister, Courtney, as well as Newton kept the foot on the gas for Leavitt, as they pushed the score to 40-14 at half. Leavitt didn't let up to start the second half, as Kristen Anderson scored the first 8 points of the half. Anderson hit two NBA-range three pointers, which were impossible for Cape to defend. Raftice was the lone bright spot for Cape, as she finished the game with 14 points. Marlo Dell'Aquila scored 8 of her 10 points in the fourth quarter as she was facing Leavitt's backups. As the final buzzer sounded, Leavitt had a dominating win in the books. Kristen Anderson finished with 21 points, and Adrianna Newton had a double-double. The Hornets will now face Lake Region in the semifinals Thursday night at the Cumberland County Civic Center.